HECAS are proud suppliers of the AquaStor-eco Unvented Indirect Cylinder to our outstanding range of boilers and boiler parts and spares. 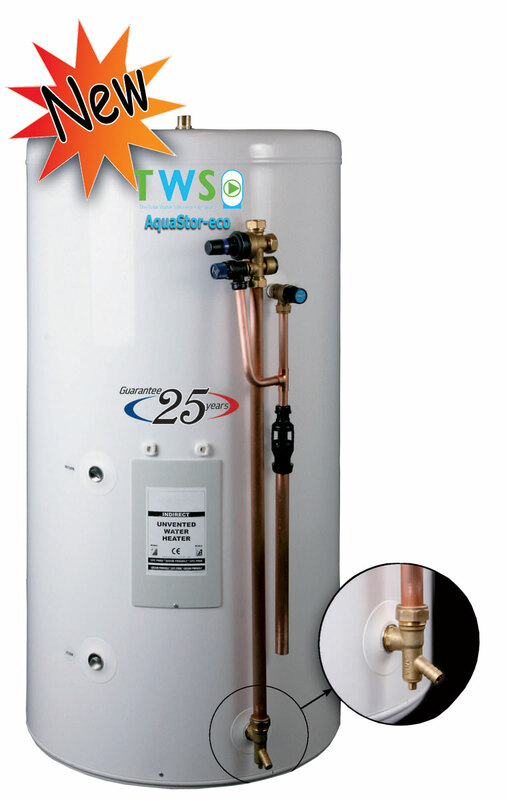 The AquaStor-eco delivers consistent excellence of hot water performance and that is what everyone wants, especially during Winter! Durable - Built from stainless steel of high grade using state-of-the-art robotic weld systems, the AquaStor-eco is epoxy-coated and features smooth bore heating coils with excellent scale-resistant qualities. Adaptable - The versatile unvented indirect cylinder has been specifically designed to work with all central heating systems and thermistor/­thermostat controllers and can be supplied with a choice of six different capacities to suit every application. A complete unvented fitting kit is supplied along with potable water expansion vessel. Cost-Effective - The very latest in thermal insulation science knowledge has been applied to theAquaStor-eco, imbuing it with world-class insulation values. Minimal loss of heat and an effective, high-volume rate of recovery means maximum savings on energy costs. Check out more info and do not hesitate to call us as our technical team are always available to offer advice and support on all of our products and services, including the new AquaStor-eco Indirect Cylinder. Have a HOT winter with HECAS!